Department of Public Works and Highways continues to track down ‘epal’ advertisements set up for the the Pope’s visit in the Philippines. 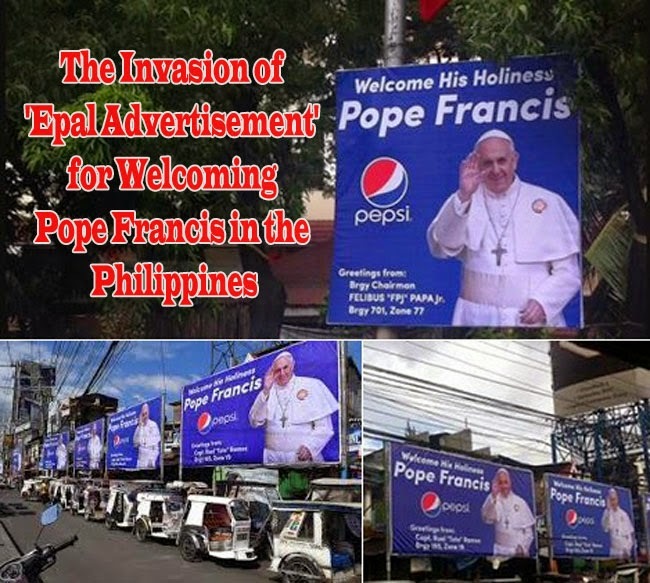 Some netizens had been in outrage after tarpaulins with a welcoming message to Pope Francis, a soda logo and a name of a politician started sprouting in Metro Manila a few days before the Papal visit. ‘Epal’ is a word used by many Filipinos for politicians or officials who attach their names in their public projects signage or put up various greetings such as on Christmas and fiestas with their photos and names. It seemed to be perceived as electoral paraphernalia of candidates that will be running on election. Metro Manila director Reynaldo Tagudando of DPWH pledged to take down the dubbed ‘epalitikos’ around the Metro Manila which had suddenly appeared on January 11, 2015, a few day before Pope Francis sets foot in the country. As reported in GMA News, Tagudando promised to do their best to take down the tarpaulins well before the papal visit. On January 11, the first such tarpaulins had appeared on the Quirino Ave right across Ospital ng Maynila. The authorities had been taking down the first batch of these tarpaulin when another set had appeared in Pasay City along Andrews Avenue near the Villamor Airbase where the Pope will land on January 15. Other than the tarpaulin with the logo of a soft drink company, another tarp surfaced. This time, the tarp bore the pope’s photo with the backdrop of a philippine flag, accompanied by a name of a barangay official. Pope Francis will arrive on January 15, 2015 and many devote Catholics are excited to meet him in person. Preparations are still underway around the metropolis and other parts of the country.